If your neighbor's dog is barking incessantly, your first step is to contact the dog's owner and voice your complaint. If that doesn't work, or if you can't locate the owner, your next step depends on your municipality's barking dog ordinance. Usually, you must contact your local animal control officer and file a formal complaint about the situation. Check your municipal website or call your animal control officer for information about the procedure in your town. If your neighbor's dog just occasionally barks at something, you'll probably have to learn to live with it. 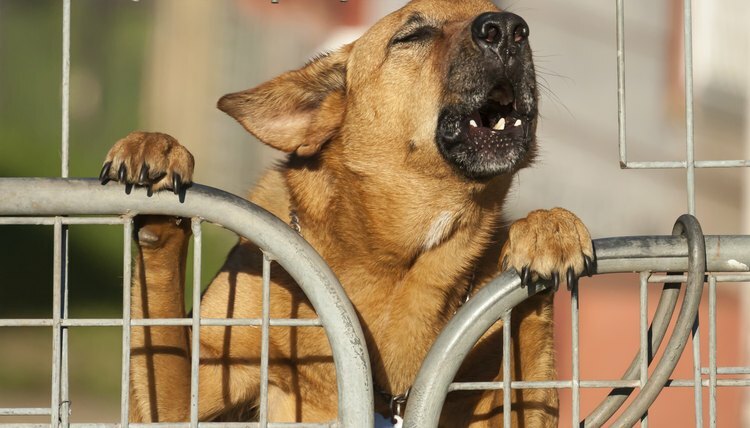 Dogs bark; crossing the line into nuisance barking depends on your local laws. In Orange County, California, for example, an owner can be cited for a barking dog if the animal barks incessantly for half an hour or more within 24 hours, or barks intermittently for an hour or more in 24 hours. Report the barking dog to your animal control officer or appropriate authority. You might have to fill out a formal complaint form, including your and your neighbor's name and address, and the time the nuisance barking occurred. Remember that by filing a formal complaint, you indicate that you're willing to appear in court to testify about the situation should a citation result. The animal control officer will then conduct an investigation.